Promoting democratic institutions, processes, and values has long been a U.S. foreign policy objective, though the priority given to this objective has been inconsistent. World events, competing priorities, and political change within the United States all shape the attention and resources provided to democracy promotion efforts and influence whether such efforts focus on supporting fair elections abroad, strengthening civil society, promoting rule of law and human rights, or other aspects of democracy promotion. Proponents of democracy promotion often assert that such efforts are essential to global development and U.S. security because stable democracies tend to have better economic growth and stronger protection of human rights, and are less likely to go to war with one another. Critics contend that U.S. relations with foreign countries should focus exclusively on U.S. interests and stability in the world order. U.S. interest in global stability, regardless of the democratic nature of national political systems, could discourage U.S. support for democratic transitions—the implementation of which is uncertain and may lead to more, rather than less, instability. Funding for democracy promotion assistance is deeply integrated into U.S. foreign policy institutions. More than $2 billion annually has been allocated from foreign assistance funds over the past decade for democracy promotion activities managed by the State Department, the U.S. Agency for International Development, the National Endowment for Democracy, and other entities. Programs promoting good governance (characterized by participation, transparency, accountability, effectiveness, and equity), rule of law, and promotion of human rights have typically received the largest share of this funding in contrast to lower funding for programs to promote electoral processes and political competition. In recent years, increasing restrictions imposed by some foreign governments on civil society organizations have resulted in an increased emphasis in democracy promotion assistance for strengthening civil society. 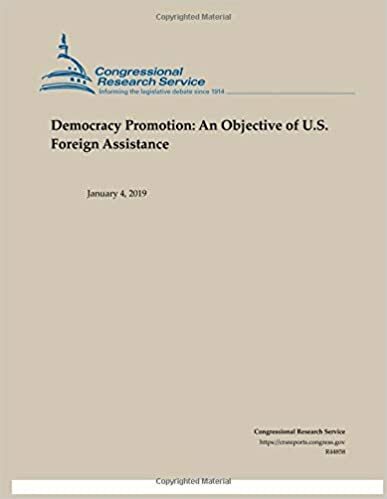 Despite bipartisan support for the general concept of democracy promotion, policymakers in the 116th Congress may continue to question the consistency, effectiveness, and appropriateness of such foreign assistance. With President Trump indicating in various ways that promoting democracy and human rights are not top foreign policy priorities of his Administration, advocates in Congress may be challenged to find common ground with the Administration on this issue.